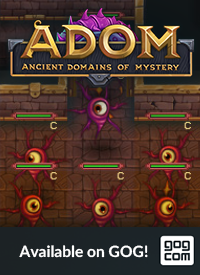 The Official Blog for ADOM (Ancient Domains Of Mystery): Full Steam release: Welcome ADOM 2.3.7! 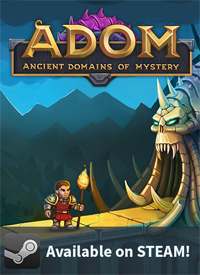 Today we are happy to announce the release of ADOM 2.3.7 to Steam! Before I summarize the most important changes and additions I'd like to ask for help in analyzing one problem we still occasionally seem to have: In rare cases there seems to be a NotEye-related crash. The crash first has been reported in the following ticket: http://www.adom.de/forums/project.php?issueid=5572 This bug also is the main reason for not yet having released a general public version because we didn't want to introduce an annoying crash bug in the first major release after such a long time. If we don't managed to get it solved by next Thursday we'll just be pushing out the general public release hoping to the find more pointers to the root problem. The "open door" menu (when you run into a door) now reacts to the SPACE bar (by selecting 'o'pen as the default). Additionally searching for traps no longer is offered as a choice if you don't possess the relevant skill. You now again can open doors by left-clicking onto them. Trying to pay if you have no gold no longer crashes the game. Auto-swapping positions with monsters (especially in walk-mode) no longer turns them hostile as this really could ruin your game. Piety increases for paladin and priest characters now are more meaningful. Some other bug fixes and minor improvements. Here you can find the full change log. 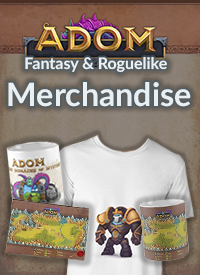 So all in all ADOM 2.3.7 is just a fine-tuning of previous releases and available now on Steam. Behind the scenes we still are searching for above-mentioned bug and are very busy finishing the last crowdfunding promises (three in-game basically left: revision of the manual, immortalizing the legend-level-donors and global highscores and two out-of-game promises: the final shipping wave and the PDF download of the ADOM Lite RPG character sheet). I'm back to work... enjoy ADOM 2.3.7! The only complaint I have about the new HUD and other recent updates is that the HUD blocks vision of the top of the map. Since I like the new HUD, I want to use it, but there needs to be some kind of spacing adjustment so that I can travel down hallways at the top edge of the map without being blinded by the HUD. I find myself hitting F10 to drop into ASCII mode just so I can see the whole tactical situation clearly.